Which one would you choose my brothers? But the truth of the matter is: We don’t have a choice of color! No one has any control of the color of their skin or of their ethnicity. And why should they? 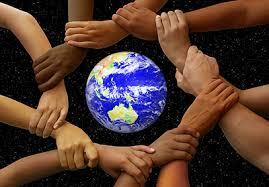 In the grand designed of the Creator, he chose to make people of different colors and ethnicity. Now while some have claim superiority based on color and racial make-up, such assumptions are not really intelligent or logical. For one, how can any one race claim superiority when that particular race (or any race for that matter) had no choice in the matter? Secondly, if the Creator made one race or people superior to another, then the Creator is divided and flawed, because whatever is created is a reflection and part of the Creator. It is neither logical nor sensible for the Creator to make one race greater or lesser than another! And it is neither logical nor sensible for people to be penalized or glorified for something (race and ethnicity) of which they had no control or choice! The Creator God is a being of supreme intelligence; therefore, it stands to reason that variety is a good thing! Therefore, at its roots, to practice racism is telling God He didn’t know what He was doing or that He made a mistake in creating diversity in the racial and ethnic make-up of people! And then, think of how boring and bland the world would be if everybody was the same! There would be no basis for personal growth because if everybody was just like you, there would be no differentiation, hence no basis of learning from someone different. I don’t know about you, but I am thankful for diversity! I can’t imagine how mundane life would be if I was just “216,000,000 of whatever!” (Star Trek fans can relate, remember: The Borg!) A creation is always an expression of its creator; therefore, it takes all of us, in all colors and ethnic groups, to express God! Finally, on the outside we may be red, yellow, brown, black, or white, but have you noticed that we all bleed red blood? While we are different on the outside, in essence, we are in a sense the same on the inside! We are one! I can’t hurt you without hurting myself! I can’t discriminate against you without discriminating against myself and the God who made you! It’s time we grow up! Racism at its core is childish and immature behavior! We don’t have a choice of color! There’s a verse in the Bible that asks: “Can a leopard change his spots?” The obvious answer is “No!” But my question is: Why should he want to? God made him a leopard with spots and everything God made is GOOD! Therefore my friend, no matter what your racial make-up or ethnicity; be comfortable and proud of the skin you are in! Don’t let small-minded and immature people judge or intimidate you based on the superficial skin color! Variety is good! Life would be so boring if we all drove red Ford pick-ups! Thank God for Cadillac, Dodge, GMC and others! Thank God everybody doesn’t wear the same color clothing! We are like a bag of different colored peanut M & M’s! They are different colors on the outside; but on the inside, they are all chocolate covered peanuts! We come in different colors and ethnicity, but at the core, we all bled red blood! We all have grey brain matter! We all come from the same source! We all are via creation; children of God! We are all people! So, I’m glad we didn’t and don’t have a choice of color! If you think we are messed up now because of the color issue, imagine how much more chaotic it would be if orange, purple, green, rainbow-colored and plaid colored people were added into the mix! LOL! This entry was posted in Inspirational Thoughts, Teachings and tagged Ethnic group, God, oneness, People, Race-Ethnic-Religious Relations, racial diversity, racial tolerance. Bookmark the permalink. ← How Does God Feed the Birds?